David Murphy Racing :: Alassak burns the candle at both ends! 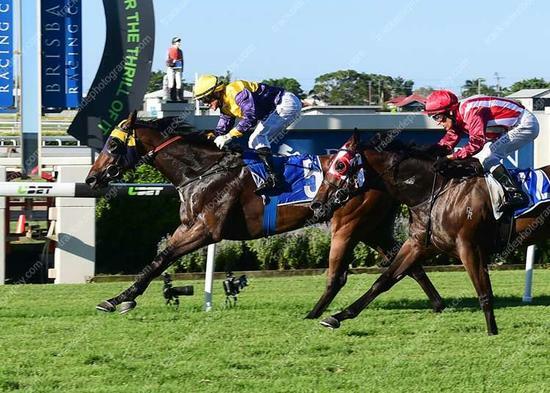 Alassak made his way to Doomben on unlucky Friday the 13th of January as the sole runner for Murphy Racing. However, black Friday definitely wasnt an issue for Alassak as he went from pillar to post in the 1350m Class 3 plate. With jockey Brad Pengelly on board, the son of Shaft jumped from barrier 9 making a V line straight to the front. Pengelly settled Alassak in the lead and was never taken on fighting hard the final furlong to make it TWO IN A ROW for connections! Well done to the Proudmans with this gelding taking his winnings to $77,000, making it 4 wins from 9 starts. There are plenty more wins in store for this talented horse!